Redskin Reed Doughty, BET EVP & CFO Michael Pickrum and Top Chef’s Spike Mendelsohn. “We’re deeply rooted here in Washington. We’ve been here for over 20 years, and obviously we have this amazing location which is really the cornerstone of Georgetown retail. We bought the building because we believe so much in this location,” shared Benetton USA President & CEO Ari Hoffman, on hand Wednesday night at the brand’s BeBenneton exclusive style setters event. 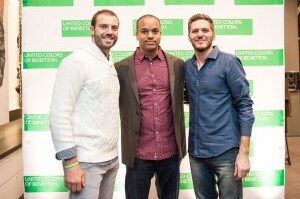 City VIPs were treated to an exclusive glimpse of the United Colors of Benetton Autumn/Winter 2013 collection at the Georgetown flagship store on some of DC’s most noteworthy fashionables and their families — like Washington Redskin Reed Doughty, Top Chef’s Spike Mendelsohn, BET Network EVP & CFO Michael Pickrum, Washingtonian’s Kate Bennett, Washington personality Susanna Quinn, author Helena Andrews, and Gilt City’s Marissa Schneider — all attired head-to-toe in Benetton’s fresh best. Guests jump started their Trick or Treating with an on-site candy bar in addition to complimentary Ketel One cocktails, prosecco, wine and light hors d’oeuvres, and then continued receiving treats as they took home gift bags filled with Benetton merch and discount cards. Previous Post: Still Looking for Halloween Happenings Tonight? !